1. Biological organisms largely consist of proteins, which are used as building materials and to perform various functions. 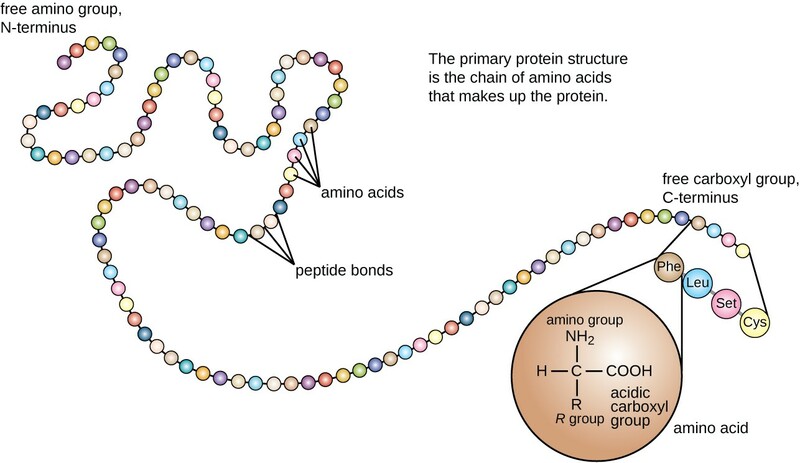 Proteins are composed of long chains of amino acids, which are then folded into their final 3 dimensional shape. There are 20 different amino acids available to use within the chain, and the particular sequence used for any given protein is determined by genes in the DNA. Much of the DNA and machinery of the cell is dedicated to the task of making and regulating proteins. While there is more to what makes and drives an organism, genes, and the proteins they describe, are a fundamental aspect of what evolution must explain. 2. Darwinian evolution requires changes to occur in organisms. 3. The Darwinian mechanism for change is completely random and unguided. Permanent changes that are passed to offspring generally require that the DNA change. This, then, effects changes to regulatory systems or to the structure of proteins. The modern explanation for the cause of these changes is that genetic mutations have occurred. Mutations are caused by either copy errors during DNA replication, or by way of damage to the DNA. There are a number of error correction schemes built into the cell to prevent and repair such things, but persistent mutations do occur on rare occasions. However, where and how these errors occur is a purely random thing, as “errors” must by definition be. Some have claimed that a mechanism exists by which life can proactively and systematically adapt to environmental pressures. This is generally based upon observations of the cell’s impressive regulatory, immunity, or error correction systems. Such systems merely leverage and preserve the DNA already in existence. It is an unwarranted stretch to claim that they bring entirely new genes into being. Further, it would have to be demonstrated that any adaptive features that higher organisms may have to aid in their survival are also imposed upon their germline cells (those affecting offspring). 4. Organisms that are allegedly further down the evolutionary path often possess completely new proteins. New body plans and functional abilities require radically new proteins. Biological explosions, like the Cambrian event, require that tens of thousands of new genes come into being. The theory is that these develop from existing genes, and we do find many gene similarities across species. However, to acquire completely novel functionality, large chasms sometimes need to be bridged between old and new gene function. As it happens, though, there are a significant percentage of genes that appear to be unique in most species, and which have no apparent ancestors. These are called “orphan genes” (or “taxonomically restricted genes”), and are said to have arisen de novo from “junk DNA.” At any point where genes came into being without precursors, the burden of evolution is compounded in that it cannot change things in incremental steps. 5. Natural selection only acts upon the changes that offer some present advantage. It does not save up neutral parts to make a functioning whole later. Here’s an analogy: Imagine you are dealt a hand of cards. If you are allowed to save and swap out cards with the conscious intention of making a royal flush, then you can quickly get there (given enough turns). But if you have to randomly swap out cards without choice, then your chances of ever finding yourself with a royal flush are the same this way as they would be if you just got a fresh hand of cards on each round. That is to say, very slim. 6. A moderately sized protein consists of 250 amino acids. Depending upon the organism, the median size of proteins is anything from 250 amino acids in length, to 375. Many are larger than 1000 in length, and the largest known is over 30 thousand. It should also be kept in mind that few proteins work as isolated units; they work as assemblies, or in cooperation with other proteins. Additionally, many proteins have corresponding regulatory proteins or require chaperone proteins to insure that they fold properly. Taking a single, moderately sized protein into our consideration seems a conservative approach. 7. The possible unique arrangements of a protein this size is 20250. There are 20 possible amino acids that could exist at each of the 250 positions in the chain. 2 amino acids give 202 possible arrangements (400). 250 amino acids gives 20250 combinations. For reference, there are estimated to be about 1080 atoms in the entire known universe, give or take a few orders of magnitude. Since it is really the genes that define the arrangement of amino acids, and it is the sequence of nucleotides that make up those genes, then the precise odds might need to be calculated at that level. However, I believe it is both less complex and more generous to focus on the amino acids. I say “less complex,” because the amino acids are coded for by triplets of nucleotides (codons). There are 64 possible codon combinations, and from 1 to 6 different codons are used to represent any given amino acid. I say “more generous,” because I’m not including things like the Start and Stop codons. There are 3 different codons used as stop indicators (end-of-protein terminators). If one of these showed up in the wrong place it would truncate the gene. A gene must also have a promoter region at the beginning, which is where the transcription machinery binds to the gene. Focusing on just the core amino acids in the protein seems a more generous approach. 8. Often, there are specific target protein arrangements that evolution must (and allegedly does) produce. This is a pivotal point in the argument, and so I will spend some time unpacking it. One of the objections to this may be, “Sure, the odds of getting any given protein are high, but to get some kind of useful protein, not so much.” It’s like saying that any set of Scrabble letters is equally improbable, but the odds are only relevant if you are targeting some set of letters that either make a word, or fit well with other words on the board. To make the analogy more accurately parallel genes, we’d need to use a couple hundred Scrabble tiles and look to produce words, sentences, and even paragraphs. Whether or not the spelling and punctuation are perfect, there are only so many ways that one might arrange letters to produce meaningful language, much less language that is actually relevant in the expected context. For instance, it needs to fit into the context of the page, or it needs to be a serviceable replacement for some other paragraph. Likewise, only some arrangements of amino acids will make functional proteins. Proteins must be configured such that they completely fold, they must have specific shapes for the function they serve, and they must have the right amino acids in place at active sites (if they are enzymes). Furthermore, as with language, the configuration of the protein is only meaningful in context. Proteins must conform to the other proteins in an assembly, act as team players in a functional system, or be configured to act as regulators for other genes. Not only must the proteins complement the system as a whole, but in many cases it is not a complete and functional system without them. Another way in which evolution has presumably met target objectives is by virtue of “convergent evolution.” This is where organisms, which are not closely related, independently develop similar features. Examples of this at the macro level can be found in the eyes of both mammals and cephalopods (e.g., squid), echolocation in bats and dolphin, and bioluminescence in a multitude of creatures. Perhaps the most curious example of convergence can be seen in the similarities between the placental and marsupial animal groups. Allegedly, the progenitors of these two types parted ways and then both lines proceeded to evolve into moles, mice, flying squirrels, rabbits, cats, dogs, ant eaters, etc. To arrive at macro convergence, it is often necessary for a whole host of supporting subsystems to come into being as well. Whether those are identical in genetic design, they are at least identical in their necessity and purpose. However, it turns out that convergent evolution can be seen even at the genetic level (“molecular convergence”) — there is not only convergence of features, but in the means of getting there. In fact, it is so common that biologists have had to rethink how they determine relatedness between species. Gene similarity can no longer be taken to mean that two creatures are closely related. 9. Even making generous allowances in the requirements for our moderate protein, the odds of selecting it would be at least one in 1025. Since some amino acids can serve as adequate substitutes for others, let’s pretend that we only have 10 of them from which we need to choose. And since some sections of proteins serve essentially filler roles (not involved in reactive or folding sites), then let’s pretend that only 1 in 10 amino acids are functionally critical. This means that for a moderate 250 amino acid length protein, there would be many more arrangements allowable to arrive at any given target functionality. However, the odds of hitting on one of them would still be 1 in 1025. 10. Assuming there are 10 million species, with 1 billion of each in continual population for a billion years, with a reproduction rate of 10 per year, you would then have 1025 chances of any offspring producing a target protein. A further problem is that any heritable mutations that might occur for each of these offspring will happen at random points within the DNA. The above statistic must be further inflated by considering the odds that the mutations would occur in the target area(s) of the DNA that are available for manipulation. For example, in the “Junk DNA,” which we are increasingly discovering to be not so junkie after all. My odds presume that all offspring yield one or more mutations in “available” space within the DNA. You can only calculate the odds of rolling six on a die if you actually pick it up and roll it on each available turn. There is simply not enough probabilistic resources (time and population) to produce the myriad number of unique genes that we see across the plant and animal kingdom. The argument suggests that even getting one in the history of Earth could be a problem. Of course, if we include micro-organisms in our equation, which exist in vast numbers and reproduce prolifically, then you can get a lot more lucky rolls of the dice. But even this will only get you so far. For instance, given a steady population of one Quintilian bacteria, reproducing once a day for 500 million years, will get you only 1.8 × 1026 reproduction events. Additionally, the history of life isn’t just about bacteria, is it? Advanced life has both more and larger proteins, and many more inter-dependencies among them. There may be statistically viable step-wise ways to build some proteins, but if there is even one average-sized protein that had to come into being largely in its present form to be functional, then the statistical problem stands. Game over. Even so, a more moderate, though effective, case may be made by calculating probabilities and population sizes to yield the statistical chance for the required changes in an existing gene to leap from one functional island to another. If a fair number of nucleotides have to change in one generation to have a selective advantage, then you are in statistically dangerous territory. This becomes especially problematic when dealing with larger animals, which have low populations and long reproductive cycles. Now, I’m open to the possibility that I have a flaw in one or more of my premises, or I’m mistaken in my calculations. I’d love to know in the comments if that’s the case. But it seems to me that the fudge-factor is so generous and the improbabilities so vast that even if I’m off by several orders of magnitude, then we’ve still got a big problem. Even if we grant that there is circumstantial evidence for evolution, this statistical problem of getting there by purely naturalistic means is a showstopper. Mr. Green may have fingerprints on the knife, and left his hat in the Conservatory, but if he’s away on business on the night of the murder, then he’s not your killer. Posted on July 15, 2018, in Evolution, Science and tagged Evolution, Genetics. Bookmark the permalink. 6 Comments. I saw a video recently on YouTube that made an argument similar to yours. This person compared the odds of getting a functional protein with 250 amino acids to the explanatory resources in the entire universe throughout its history. So, he estimated the universe to be something like 13.8 billion years old, and he came up with an estimate of the number of planets in the universe, and he estimated one try per second with each planet being composed of nothing but amino acids, and he included the average mass of the planets, which he estimated to be the mass of the earth. So they were pretty generous assumptions. He still ended up showing that it’s improbable that even one functional protein with 250 amino acids would form in the entire history of the universe. The only problem I had with his argument was that he assumed the string of amino acids would have to all be formed at once. Or at least that’s what he appeared to be assuming. So he was really calculating the odds that 250 amino acids would spontaneously assemble themselves in a functional protein in one try rather than having multiple stacks of amino acids build on each other. Other than that, I couldn’t see any flaw in his reasoning. Your argument appears to be a little more sophisticated, and I’m not sure you’re making the same mistake he is or not. I’d have to read your post a few more times. Thanks for the video. It offers graphic illustrations as only a video can. I’ve got a couple problems with it, though. He uses a 200 amino acid protein for his average protein. The median value for almost every type of creature is larger than this. For humans it is nearly 400. It doesn’t matter, though. Even the smallest protein is enough to make the statistical case with the probablistic resources actually available in the universe. He chooses a completely arbitrary value (without justification) for the number of theoretically possible enzymes. His 1 trillion value may be reasonably generous for the number of *types* of functional proteins, but it is true that there are a variety of ways that one could assemble the same functional protein. I try to account for this by assuming that every amino acid has a viable substitute, and that only 1 tenth of the amino acids are critical for the desired structure/function. This is far, far more generous than his assessment, which assumes that each protein must be arranged in one particular way. This, combined with a generous guess at the number of possible types of proteins, would probably make it statistically viable for millions of planets with amino acid soups to produce at least one such protein (never mind the problem of producing oceans of all 20 amino acids, the problem of chirality, and a natural mechanism for building only polypeptide chains). What’s unique to my argument is found in point #8. I’m not arguing that no protein could possibly be produced. I’m arguing for low probabilities for producing *target* proteins, which evolution seems to find necessary. Even *those* I would grant might happen in a vast universe, but to then have that happen again on the same planet twice would be a miracle, much less to happen again and again, with regularity, to get all the proteins necessary for the diversity of the life we see on earth. The video does mention the problem of repeatability on the same planet, though. I’m not sure what you mean about stacks of amino acids building on each other. Perhaps you mean that some form of accumulation over time could happen. That’s surely what would have to happen in the genes, but as I point out in #5, natural selection does not save up for some future advantage. Maybe the confusion is in the nature of how he (the video) and I are implying that proteins are formed. For me, I’m assuming that an organism exists already. I’m not arguing against abiogenesis here; I’m arguing against evolution. I’m arguing against unguided manipulation of the DNA arriving at new genes. In this scenario, coming up with a winning hand (one that natural selection saves) is really the same whether you deal a new hand each turn or just randomly swap out cards on each turn. In the video, the implication is that amino acids are forming up out of the soup on their own. In this case, I guess you would mean that over time you’d get some making connections that later get built upon. Two things though. First, this would make the process slower to assemble his 200 amino acid chain. Second, here, there would also be no saving up of functional subunits. If the first 10 amino acids are arranged such that they don’t match any functional protein, then they are a waste, and any further connections made to them are a wash. But if you get 10 that match a target protein and the next 10 do not, then that growing chain is trash. That first 10 do not magically spread across the landscape so that you get many tries for the next round of 10 connections. This leads to another problem with his scenario. Since his is more of a jab at abiogenesis, critics might say that building proteins, like we see in existing organisms, is irrelevant. It is alleged that the first things produced were simple self-replicating molecules, like maybe RNA. Lack of evidence, an environment for producing and assembling the parts, and viable prototypes aside, it can be imagined that these could be “simple” things that defy statistical examination. The unknowns favor their credulity. At some point, though, the problem of arriving at some necessary molecular sequence emerges, be it the original self-replicating molecule, the irreducible machinery behind the “Central Dogma,” or the proteins on which life presently depends. Even *those* I would grant might happen in a vast universe, but to then have that happen again on the same planet twice would be a miracle, much less to happen again and again, with regularity, to get all the proteins necessary for the diversity of the life we see on earth. It sounds like you’re assuming each new protein would have to be made from scratch. But couldn’t new proteins be made in various other ways? For example a gene could be duplicated, or part of a gene could be duplicated, then it could change over time through mutations, including replacement of individuals base pairs, or deletions of segments or addition of segments, etc. Each new gene wouldn’t have to be made from scratch, would it? I’m not arguing against abiogenesis here; I’m arguing against evolution. Ohhh!!!! I had a misunderstanding. My bad. Second, here, there would also be no saving up of functional subunits. If proteins are just being made from scratch in a soup of amino acids, I don’t see any reason to think a protein would have to have any function. You could just have a bunch of proteins floating around in the soup doing nothing until eventually a protein emerges that does something. I wouldn’t think evolution would kick in until you had some kind of self-replicating molecule. But anyway, don’t most people think RNA came first and proteins later? In that case, the question ought to be over the creation of RNA rather than proteins I would think. It is alleged that the first things produced were simple self-replicating molecules, like maybe RNA. I wrote the above before getting to this part. It’s good to know I’m at least on the right track. Regarding your first paragraph, my answer to this is found in points 4 and 5. It is true that the way this is imagined to happen is by changes to existing genes, copies of genes, or some workbench area, like “junk” DNA. But if the “target” gene is very unlike the original DNA, then it is effectively a matter of developing it from scratch. And while mutations are occurring to explore the probabilistic landscape, there is nothing to preserve any *potential* gains from further corruption until the whole gene arrives at some functional state. This also presumes that the proto-gene is 1) being expressed the whole time so that it can be tested in the cell, 2) that the organism can tolerate this and all the other malformed proto-genes being continually tested in the cell, and 3) that the changes effect germ cells (those that are passed on to offspring). Orphan genes are the most direct case of something completely new being made essentially from nothing (or “junk” DNA). Here’s the video I saw. He went into the details of how he calculated the odds. I think maybe your argument would be more clear if you did some calculations and explained them like the guy did in this video. Lovely argument. How does species then “grow” to what we see today? Whosdunnit?